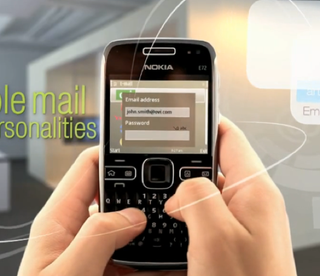 The capable Nokia E71x, not exactly an old phone even by the fast paced renewal process that's inherent in the tech industry, is about to get usurped by the business-class E72, seen here getting handled in a promotional video. Updated. Coolest takeaway? Probably the inclusion of an optical mouse instead of the clickable one found in the similar models. As is the case with promotional videos, availability and pricing are not present. Update: The video is now private, so here's a screen grab I took earlier in the event the YouTube user made his previously public video private.